Roasted Masala Cashews are a quick nutritious snack, or a popular bite to pass around with drinks when you warm up your guests. In India we eat many different types of spicy nuts and this is a method my mom used to make cashews a bit more interesting. You will need some self-control when you make these though, as they are so simple & tasty. I suggest making them for a party so you’re not the only guilty one snacking! If you are going to pick one season to eat cashews, pick winter. Their thiamine helps kick up the nervous system to cope with winter blues and holiday stress! They also contain some of the same good fats as olive oil, which are good for your heart. When we were little, we nagged the adults to buy us streetside snacks of nuts filled in newspaper cones. 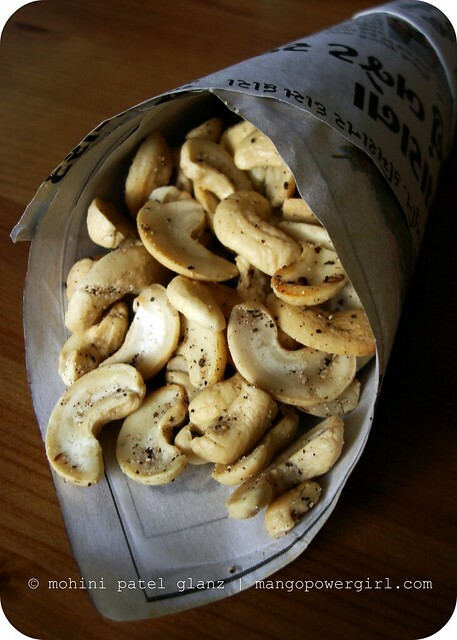 I decided to serve Roasted Masala Cashews the same way, but I lined an Indian newspaper with parchment paper and served up some healthy nostalgia, a favorite snack from when I was a girl. 1. On low heat, melt the ghee in a skillet, then add the salt & pepper to mix. 2. Add the cashews and toss them around to coat with ghee and seasoning. 3. Keep tossing till the cashews are slightly pink, which means they’re toasted. Have a taste and adjust the salt if you like. 4. Serve them right away, or cool before storing in an air tight container. You’ve got Gujarati newspaper too?! 🙂 The Cashews looks so good. Sometimes, a beautiful picture such as this one is all you need to be reminded of how simple and delicious such snacks are.